All 3 US (major) operators that sell the iPhone report their unit sales, and AT&T and Verizon report total smartphone sales. 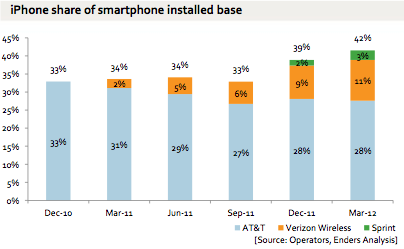 The iPhone is utterly dominant. 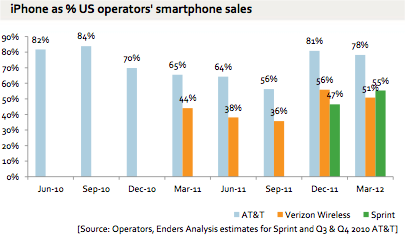 Even at Verizon Wireless, which has aggressively promoted Android, the iPhone is now over 50% of all smartphone sales. Expanded distribution and the new iPhone 4S combined mean that the iPhone now has 42% of all US smartphones in use today, and growing. As should be obvious, this means that though Android is outselling the iPhone 2:1 globally, the iPhone is substantially outselling Android in the USA.